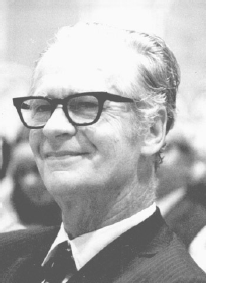 B.F. Skinner (1904–90) was a leading American psychologist, Harvard professor and proponent of the behaviourist theory of learning in which learning is a process of ‘conditioning’ in an environment of stimulus, reward and punishment. In improving teaching it is less important to find new reinforcers than to design better contingencies using those already available. Immediate and consistent reinforcement is, of course, desirable but this is not to deny the importance of intermittent or remote reinforcers. The student who knows how to study knows how to amplify immediate consequences so that they prove reinforcing. He not only knows, he knows that he knows and is reinforced accordingly. The transition from external reinforcement to the self-generated reinforcement of knowing what one knows is often badly handled. In a small class the precurrent behavior of listening, reading, solving problems, and composing sentences is reinforced frequently and almost immediately, but in a large lecture course the consequences are infrequent and deferred. If mediating devices have not been set up, if the student is not automatically reinforced for knowing that he knows, he then stops working, and the aversive by-product of not-knowing pile up. Through a proper understanding of contingencies of reinforcement, we should be able to make students eager and diligent and be reasonably sure that they will continue to enjoy the things we teach them for the rest of their lives.